How I’ve missed blogging, but somehow haven’t been up it. I’m halfway through my first pregnancy, pregnant with a boy(!) we just learned. That might explain why I didn’t have too much morning sickness and always felt like eating first trimester? Unfortunately, second trimester has surprisingly so far been more of a slog. 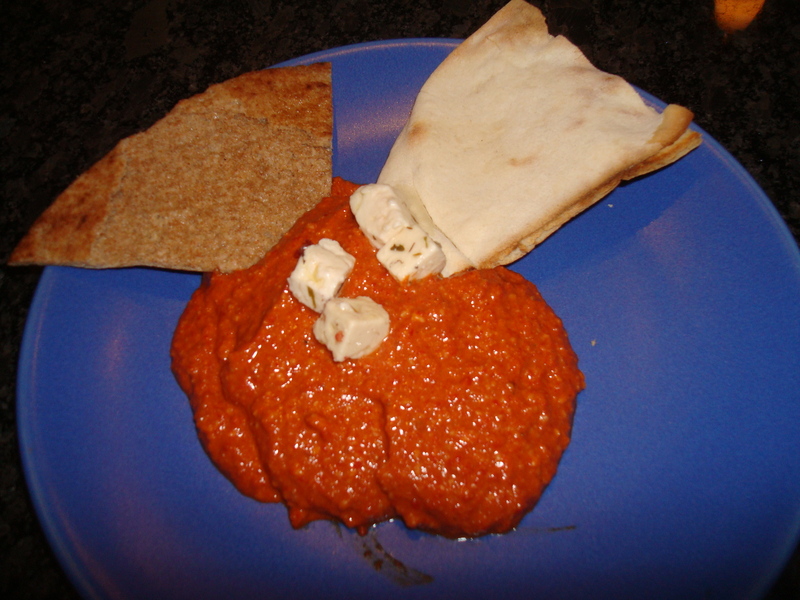 But I wanted to write to sing the praises of muhammara, another great roasted red pepper (with walnuts and pomegranate) dip that apparently hails from Syria. I fell in love with this recipe we just had from Paula Wolfert’s The Cooking of the Eastern Mediterranean. Dan’s former department chair prepared it as part of a delicious Middle Eastern spread she put together for a visiting economist from Turkey. Shawna and her husband, Rolf, sure know how to entertain. They’re especially known for their Scandinavian delicacies–gravalax, pickled herring, fresh currant-infused aquavit, home-smoked duck. Rolf is from Sweden. He even grows pinot noir grapes, which he bottles into a coveted “Grapes of Rolf” vintage. A case or two of his wine has been known to woo job candidates here. Back to muhammara. Like avjar, it has an addictive tang that pairs so well with pita and goat cheese or feta. If you, like me, try to avoid imported bell peppers this time of year (apart from the carbon footprint, they have that off, less-than-fresh taste), just substitute jarred roasted red peppers instead. Why bother roasting peppers out of season anyway? For another muhammara variation, check out this one from Ivy Manning in the current issue of Portland’s MIX. Pomegranate molasses is a key ingredient that you’ll enjoy having around for salad dressings. I believe Corvallis cookbook author Jan Roberts-Dominguez also has a muhammara recipe (with hazelnuts instead of walnuts) in her new Oregon Hazelnut Country cookbook. Laura – Glad to read about your culinary adventures again. Dip sounds delicious; maybe useful for passover, too!